In recent years Pamsimas (Penyediaan Air Minum dan Sanitasi Berbasis Masyarakat / Community-Based Water Supply and Sanitation) program has been promoted with a view to respond to the challenge of water shortages and sanitation in rural areas of Indonesia. Improved drinking water and sanitation facilities are presumed to enhance access to water resources and improve hygiene. In the meantime, the delegation of authority from the central to local governments in providing for people’s basic needs (including water supply) became a condition of participation in the program. 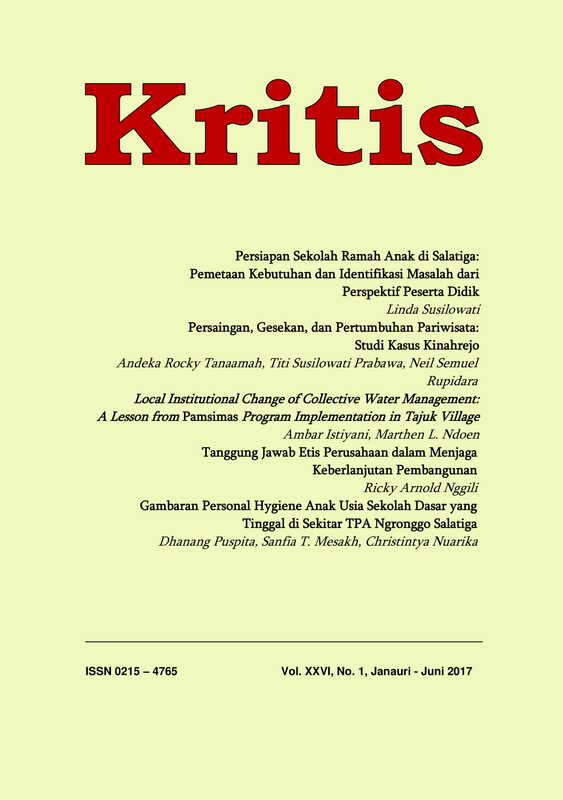 This paper presents the results of a case study of Pamsimas program as it was implemented in Tajuk Village, Semarang Regency. This paper is an extention of the previous study on the dynamic of water management in decentralization era. This update paper uses political economic and power analysis to understand farmers’ decision in responding to the program. It is found that Pamsimas changed a set of institutional rules governing the use of water resources that are the adoption of water pricing mechanism and the establisment of a new collective choice body. It is argued that farmers’ decisions to implement Pamsimas is not because of the hygienic practices and the importance of participation as narrated by the policy makers, but is entirely centered in the benefits of redistribution.